It’s worth pointing out that whilst our Scrooge-like civic masters in the Grey Lubyanka were handing round the upturned, moth-eaten and brylcream scented flat cap of Anthony Harris, all the time protesting that they couldn’t afford a Christmas tree or much in the way of festive cheer, over in the Tiny Tim Cratchett people’s republic of Brownhills we seem to have an awful lot of good stuff to come. This will be a bit of a shock to those following the inane, insane ramblings of the elected members who performed a seasonal pantomime begging for funds for a tree before u-turning again and stumping up some cash. 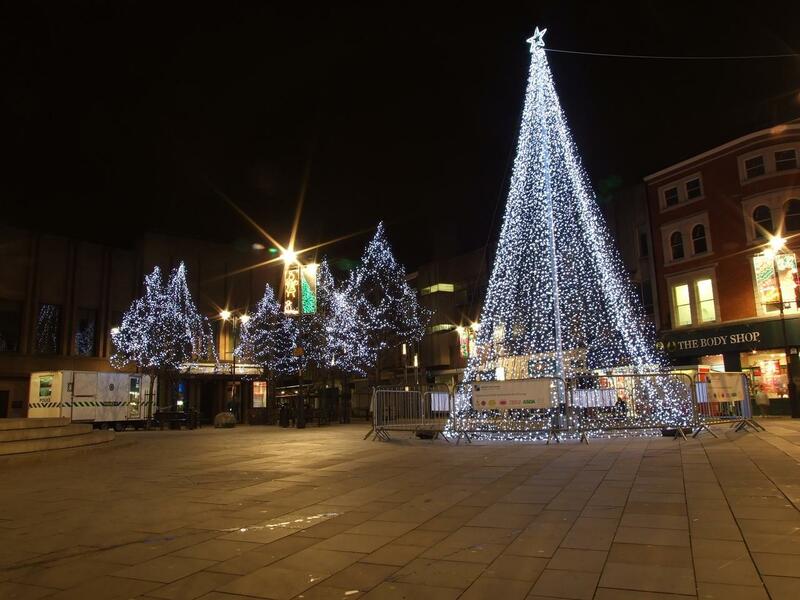 The much vaunted sponsorship of the tree now procured for Walsall town centre is hardly revolutionary – it was funded in this manner for years before, right up until we were insulted with the fairy-light lamp-post wigwam provided in recent years by Amey. Since Mike Bird is desperate to prove how impoverished our civic overlords really are (but not too skint to buy new parking meters or pay a Human Resources temp £750 a day plus hotel expenses) it’s surprising that Brownhills gets a slice of the Christmas cake at all. Some wonk thought this was a good idea. Hideous, cheap and nasty. A bit like the council. Photo by Lee Jordan. It’s not all Dickensian austerity though. In Walsall Wood, Councilor Mike ‘Burger Boy’ Flower will be personally purchasing the tree for the village, an act of generosity and felicty that marks him head and shoulders above the droids he stands with. In Brownhills, someone has also chucked the traditional string of blue LED lights over the trees by Morris. Inspiring it is not, but you have to admire the sentiment. 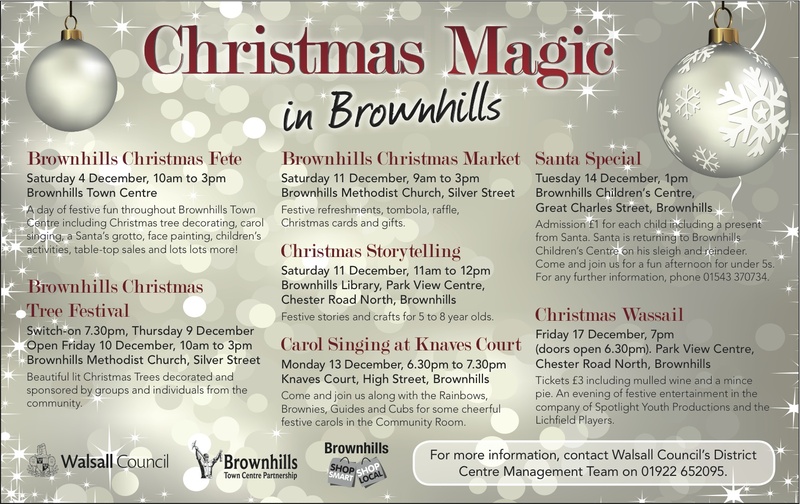 If you’re in Brownhills, do try to attend some of these events – people work hard to put them on and with the new market going well, it would be nice if we could keep up the momentum. You can download a .PDF version of the flyer below, which you can print for your reference or use as a handout. I wish all involved well, and I look forward to a mince pie and some festive cheer in the town. Lets hope the plump, overfed turkeys leading the council get a good stuffing in the new year. It’d be nice to see them roasted and carved, preferably before being fed to the dogs. Some great stuff here. Click on the image for a larger, readable version. This entry was posted in Brownhills stuff, Churches, Clayhanger stuff, Environment, Events, Followups, Fun stuff to see and do, It makes me mad!, Just plain daft, Local media, Local politics, Reader enquiries and tagged Brownhills, Brownhills Christmas Evens, Brownhills Market, Cheap tat, Christmas Magic in Brownhills, Councillor Mike Flower, Festivity, Local politics, Mike Bird, Shop Local, Shop smart, Silly, U Turn, Walsall, Walsall Christmas Tree, Walsall Council, Walsall Parking Meters, Walsall politics, Walsall Wood. Bookmark the permalink. I’ve seen that poster in a shopfront in Brownhills this very afternoon, and it’s very nice to see- I think I’ll drop in to some of the events. Big kudos to Mike as well, as seemingly the only councillor in the area with an interest in actually improving the area. Walsall Wood High St is lit up again, and actually looks better for it, so seriously, big thanks to Mike.